In August, Trinity College and the University of Melbourne mark the first-year anniversary of The Professor Sir Joseph Burke Gallery in Trinity’s new Gateway building, situated on the University boundary with Tin Alley. The Gallery is named in honour of Sir Joseph Burke, who arrived in Australia to commence as the University’s inaugural Herald Chair of Fine Arts in 1947, a position he held until his retirement in 1979. In his later years as Herald Chair, Burke was also a resident art tutor at Trinity College. 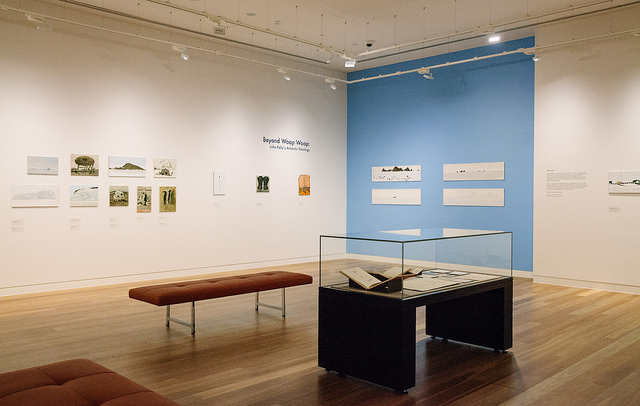 The new gallery provides Trinity with an excellent space to exhibit its collections and recognises Burke’s lasting contribution to furthering Australia’s visual arts. Having exhibited works from the College’s own collection of Yolngu art from the Yirrkala-region of Arnhem Land late last year, the Burke Gallery is currently showing Beyond Woop Woop: John Kelly’s Antarctic Paintings. This exhibition presents the outstanding body of work that internationally renowned artist John Kelly produced as artist-in-residence with the Australian Antarctic Division during two months in late 2013 painting en plain air in Antarctica. The Gallery is open to the general public on Tuesdays and Thursdays 10am to 4pm in the Gateway building at Trinity College.